“The British Cinematograph Industry has made a magnificent response to the country’s call for men at this terrible crisis,” observed the trade journal Bioscope shortly after Britain’s entry into the First World War. The magazine requested that “managers of the cinematograph business houses or theatres, any of whose workers have temporarily left them for this noble purpose, kindly communicate the fact to us, mentioning the name of the man and the regiment he is joining” (“Trade Topics”). The following issue’s “Roll of Honour” (20 Aug.), a list of members of the trade who had joined the armed forces, did not mention any men from Irish companies, but Irish correspondent Paddy observed that one of the sons of Irish exhibitor James T. Jameson had “been called to the colours” (Paddy, 20 Aug.). 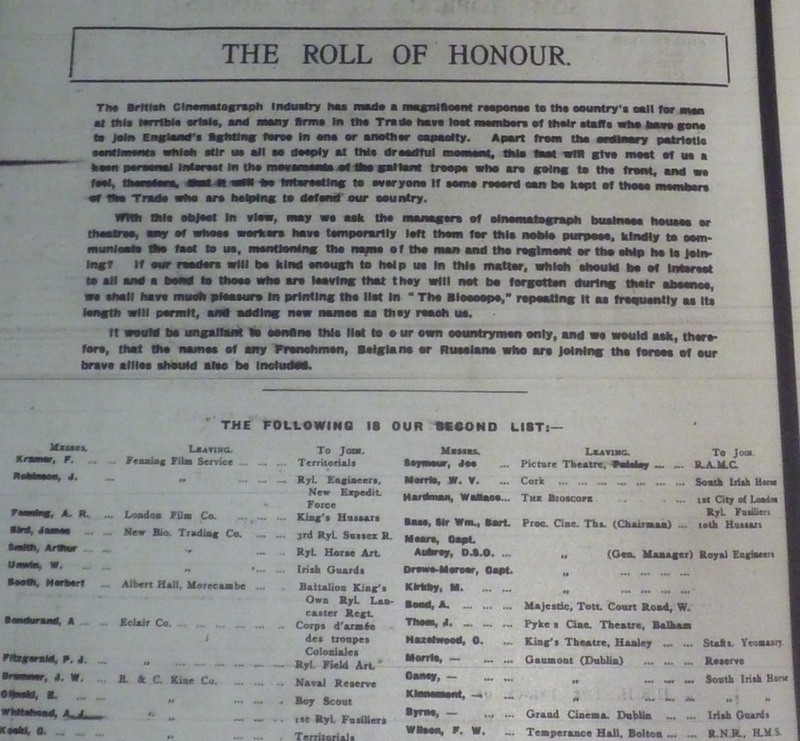 The Bioscope’s second “Roll of Honour” for men in film businesses who enlisted featured five Irishmen; 27 Aug. 1914: 784. By early October, Dublin’s Evening Telegraph was putting the number of Provincial staff who had “joined his Majesty’s forces” at 109 (“Picture House Employes”). 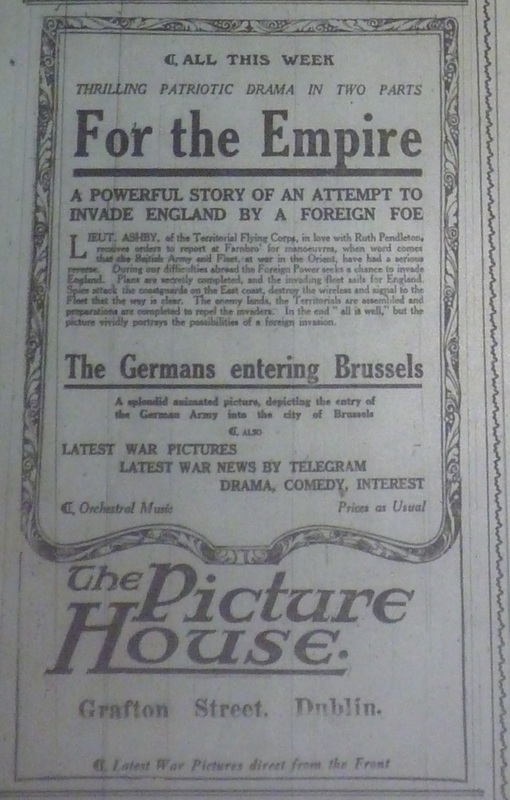 Ad for war films at the Grafton; Dublin Evening Mail, 14 Sep. 1914: 2. Some Irish film production companies expanded their business during the war, taking advantage of new filmmaking opportunities – although these were not without risks – as well as pursuing some innovative work. Norman Whitten of the General Film Supply featured in a short article in the Bioscope in mid-September. It explained that Whitten had mounted a platform in front of a train to take “the beautiful scenery around Galway Bay. In the light of recent stirring events, the ‘topcials’ secured should be of distinct value to exhibitors” (“New Series of Irish Topicals”). As well as this kind of work that he had been doing for some time, Whitten – assisted by a Mr. Ashton who presumably had taken the place of Whitten’s previous cameraman, Benny Cann – made several war-themed films, but not as many as he planned. In early September, Paddy reported that Whitten had been threatened with being shot if he persisted in trying to film soldiers embarking on transport ships at Dublin’s North Wall. The War Office had revoked the permit to film that Whitten had earlier obtained. As Paddy observed, this was disappointing for Whitten, who had been building up his business in local topicals to a point where his film Funeral of Victims Shooting Affair Sunday, July 26th circulated in eight copies, which “constitutes rather a record” (Paddy, 3 Sep.). This film was of continuing relevance because of the campaign of the relatives of victims to get Dublin Corporation to petition the king (“Bachelor’s Walk Outrage”). The film ran 100 feet (or about 1 minute 40 seconds), but it is not clear why Paddy considered it “a great advance over the system of still slides,” which it clearly resembled, albeit without the presence of a lantern lecturer to explain the images. The latter was presumably shot after Whitten had been given a new permit. The potential public interest beyond Ireland in these pro-war shorts was indicated by the fact that British distributor Cosmopolitan was handling them. One working-class picture house that he visited was the Picturedrome in Harcourt Road. For Paddy, the Picturedrome was “a theatre which I regret to find I have not mentioned in these notes for some time,” but he was not alone in his lack of coverage because the Picturedrome – catering for a local working-class audience – did not advertise in the Dublin newspapers and so was ignored by reviewers. “Business here was fairly brisk,” Paddy observed, “considering the regular patrons of the hall are drawn from men now with the colours.” Manager Will Sommerson was presenting a bill dominated by three Vitagraph films The Auto Bandits of New York, Old Reliable and Her Mother’s Wedding Gown. “[I]t’s astonishing the popularity of Vitagraph films in Ireland” – although The Auto Bandits seems to have been made by the Ruby Feature Film Company. The only other film he mentioned at the Picturedrome was “an exceptionally interesting scenic, ‘The Volcanoes of Java’” (ibid.). The most notable thing about the Picturedrome’s programme is that Sommerson appears to have chosen none of the war-themed films that some other exhibitors were making a point of including on their programmes. 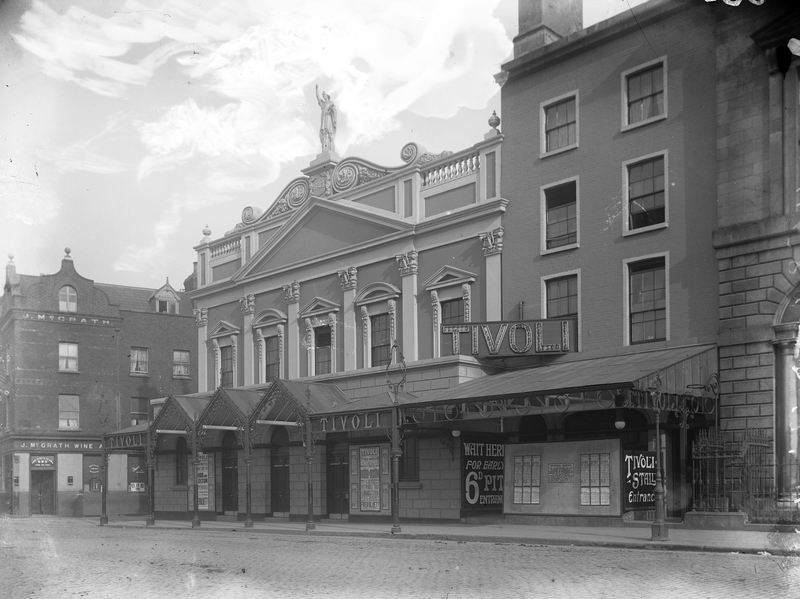 At the Tivoli Theatre of Varieties, for example, the music-hall bill included the films Cyclists of the Belgian Army and The 23rd French Dragoons, which “had been specially procured by Mr. Charles M. Jones for the benefit of his patrons – a large proportion of soldiers being amongst the audience each night” (ibid.). At the Dorset Hall, manager Frederich Sullivan accompanied the dramas Jim, the Fireman (Britain: Barker, 1914) and In the Wolf’s Fangs (US: Bison, 1914) with “the authentic film of the Germans entering Brussels, and I noted that this film had been passed by the Censor” (ibid.). 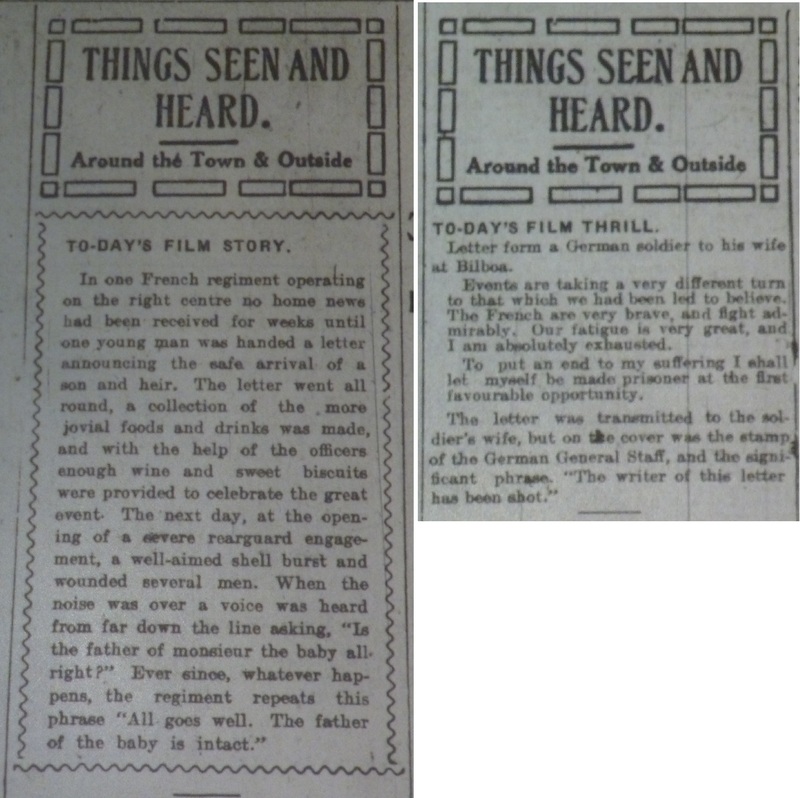 The Man About Town’s “Things Seen and Heard” column in the Evening Herald began with film items on 5 and 10 Oct. 1914: 2. The role of the picture house attendant who cheered was clearly crucial here, but music also played a significant part in this case and generally in shaping the experience of patrons. 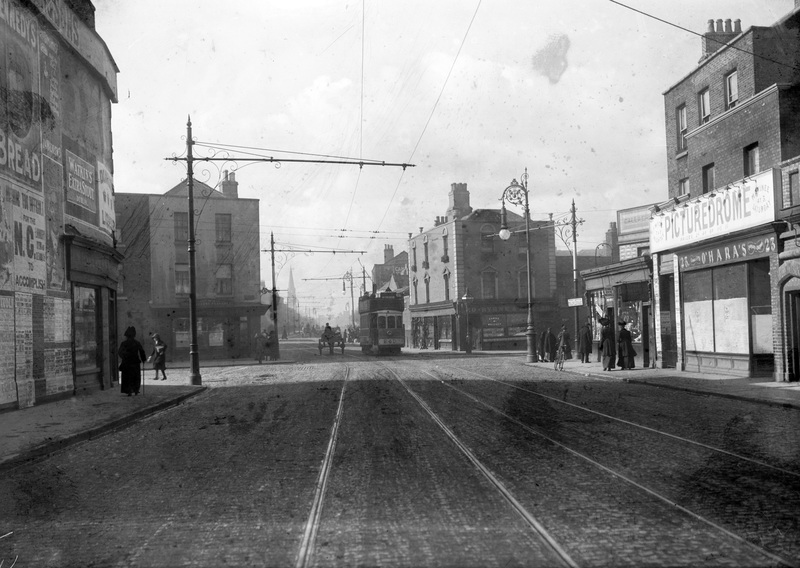 Paddy commented that the music at the Phibsboro Picture House at the northern edge of the city was “deserving of great praise, and no one takes more interest in her work or gives a more spirited and tasteful exhibition of playing than Miss Eagar”(24 Sep.). The Man About Town included an item entitled “‘Glorious’ War,” in which he demonstrated the way that talented musicians could influence the audience’s reception of war films. “While I was at a picture-house the other night,” he began, “scenes were shown of Belgian wounded being removed in ambulances. The pictures were rather harrowing, and as they were being displayed the band discoursed Elgar’s famous march, ‘Pomp and Circumstance.’ It set one thinking” (14 Sep.). Therefore, although Irish film businesses generally embraced the pro-war patriotism that dominated the British industry, local exhibitors and audiences were more ambivalent about what they were seeing on the screen. “Bachelor’s Walk Outrage: Relatives of the Victims: Corporation Resolution: To Petition King.” Evening Telegraph 5 Oct. 1914: 4. The Man About Town. “Things Seen and Heard: ‘Glorious’ War.” Evening Herald 12 Sep. 1914: 2; 14 Sep. 1914: 2; 24 Sep. 1914: 2; 30 Sep. 1914: 2. “New Series of Irish Topicals.” Bioscope 17 Sep. 1914: 1079. Paddy. “Pictures in Ireland.” Bioscope 20 Aug. 1914: 752; 3 Sep. 1914: 913; 24 Sep. 1914: 1129; 1 Oct. 1914: 31. “Picture House Employes.” Evening Telegraph 10 Oct. 1914: 3. “The Picture House Staff: Many Men Off to the Front.” Dublin Evening Mail 21 Aug. 1914: 4. “Roll of Honour.” Bioscope 20 Aug. 1914: 784; 27 Aug. 1914: 3 Sep 1914: 869. “Trade Topics.” Bioscope 13 Aug. 1914: 617.